Varicose veins can develop as early as age 13, and will affect the majority of women and a large percentage of men as they advance in age. Healthy leg veins pump blood though the body’s veins to the heart through a system of valves. These valves open in only one direction, to prevent blood from flowing backwards. When the valves malfunction, blood flow is disrupted and pooled blood collects in the area, causing enlarged and ropy appearing varicose veins. Aching, painful legs with or without leg cramps. A feeling of leg heaviness that worsens throughout the day. Ankle or lower leg swelling and even skin ulcerations or bleeding. Today, a number of highly effective non-invasive treatments are available to manage varicose veins. The most recent innovation in non-invasive vein treatments is VenaSeal, a medical adhesive that physically seals the defective vein and redirects blood to flow through nearby healthy veins. Minnesota Vein Center, in 2015, was the first to offer this treatment option in our upper Midwest region and perform this treatment weekly. Some have referred to this treatment as the ‘superglue’ for the veins. The in-office procedure begins with a small local injection of anesthesia for access to the vein. Using ultrasound imaging as a guide, the adhesive is delivered through a catheter by way of a single small needle puncture in the leg. The delivery process takes about 15 minutes. 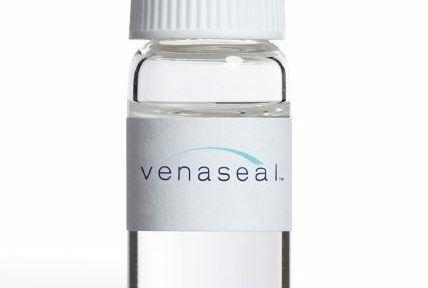 Because VenaSeal requires only a single needle insertion to deliver the sealant, a patient’s risk of pain and brusing is reduced. VenaSeal also results in a faster recovery time, with no scarring and eliminates the need for patients to wear compression stockings following the procedure. Patients with symptoms of visible varicose veins or those with complaints of leg achiness, heaviness, leg fatigue or swelling may be a candidates for this treatment after appropriate evaluation by Dr. Pal and a venous ultrasound exam in our IAC Vascular Lab. To learn more, call for additional information or schedule an evaluation at Minnesota Vein Center. 651-765-8346.